All children are holders of important human rights. Twenty-five years ago in 1989, over a hundred countries agreed a UN Convention on the Rights of the Child. In the most important human rights treaty in history, they promised to protect and promote all children’s equal rights, which areconnected and equally important. In the 54 Articles of the Convention, countries make solemn promises to defend children’s needs and dreams. They recognise the role of children in realising their rights, being heard and involved in decisions. Especially, Article 24 and Article 27 defend children’s rights to safe drinking water, good food, a clean and safe environment, health, quality of life. And Article 29 recognises children’s rights to education that develops personality, talents and potential, respecting human rights and the natural environment. The “Voices of Future Generations” series is inspired by the rights outlined in the Convention on the Rights of the Child, namely Article 12 and 13, which affirm children’s right to participation and expression. Especially, given the nature of challenges such as climate change, which will disproportionately affect future generations, ensuring children’s participation and voice is of utmost importance. Article 12 of the Convention makes a strong, open, call for children’s participation: State Parties shall assure to the child who is capable of forming his or her own views the right to express those views freely in all matters affecting the child, the views of the child being given due weight in accordance with the age and maturity of the child. The Convention continues in Article 13, declaring that: The child shall have the right to freedom of expression; this right shall include freedom to seek, receive and impart information and ideas of all kinds, regardless of frontiers, either orally, in writing or in print, in the form of art, or through any other media of the child’s choice. The convention is available here. 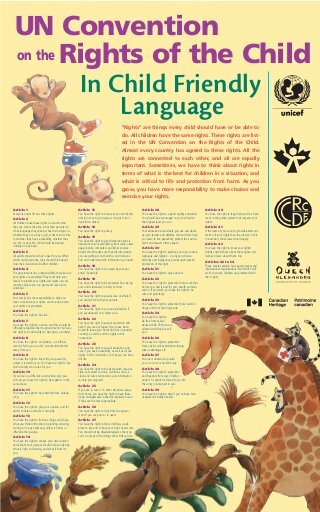 To discover more about the UN Convention on the Rights of the Child, see the Office of the High Commission on Human Rights' website.